The Game menu allows you perform operations on the current game or select other games. Please note the shortcut keystroke for common operations are also defined on the menu, you can use the keyboard shortcut to invoke the associated function directly from the keyboard. You can also see shortcut icons for some menu items on the menu as a guide that there is a shortcut toolbar icon for the option. Please note if the existing game in the game notation has been changed and not saved you will be asked if you wish to save it before going to the selected game. Any selected games which is opened will then appear in the game notation pane. 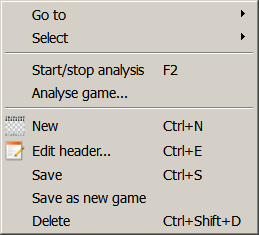 This menu item opens the Analyse game dialog so you can set the settings for the current engine to analyse the game. If the Analysis Explorer pane is not open it will be opened. This menu item opens the Edit header dialog so you can view or edit the header information for the game. This menu item saves the current game in the current database replacing the existing game if it was already in the database. 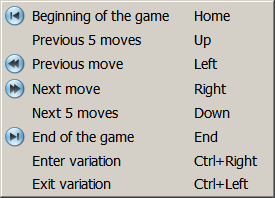 This menu item saves the current game in the current database making a new game entry for it in the database. Please note this option should be used with caution since creating another instance of the same game in the same database will reduce the value of the database statistics used in the Opening Explorer. It is also not good practice to have multiple copies of the same game in a database, if you want the duplicate game for a special purpose, consider whether you should copy the game into a different database for that purpose.